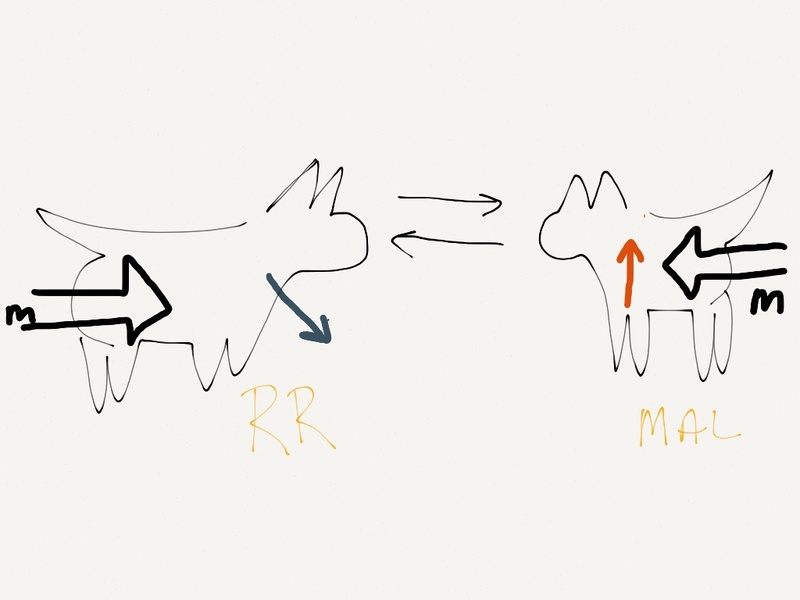 This diagram refers to the first seconds of the video linked below wherein the Rhodesian Ridgeback is lowering its front end and the two dogs are engaging without exhibiting much friction at least for one or two seconds. There are two very important elements. One is that they are locked in what I call the “Mirror Effect” symbolized by the two arrows —-> <—- . Also both dogs have very strong upward thrust in their forequarters (^) (^) as evidenced by the drive to get higher (this tendency will be looked at in much greater detail in a series of diagrams to follow) than their counterpart. 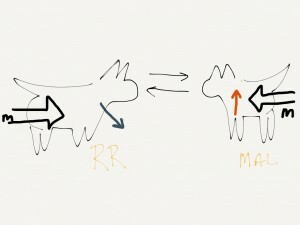 In the initial seconds of this encounter however, the upward thrust of the RR does indeed deflect forward and down and due to this the two dogs can make relatively strong physical contact. But by no means has there been a transfer of momentum. Nevertheless there is enough of a DOWN and an UP manifestation of shoulder tensions in response to the blocking action of the Mirror Effect. (v) <–> (^) and so in that configuration the two dogs can fit together and their physical contact is arousing. We should note that the RR is not “flopping polarity”: i.e. trying to touch the top of its shoulder blades to the ground, and this is because the two dogs are still locked in the Mirror Effect and the RR still needs to get higher. 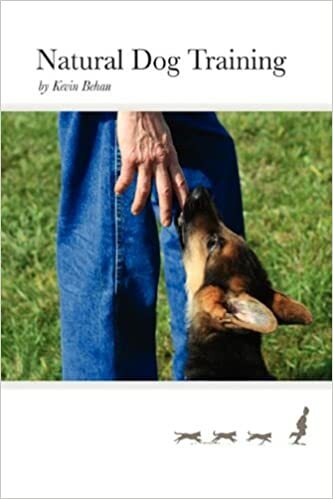 The upward thrust in its forequarters has not been “grounded.” Both dogs are more concerned with the other dog’s eyes and their relative height, the degree of tension in the other dog’s forequarters which is the drive to go up, and the unresolved question of transfer of emotion so that they are still invested with this force of momentum, than they are with the other dogs’ body. 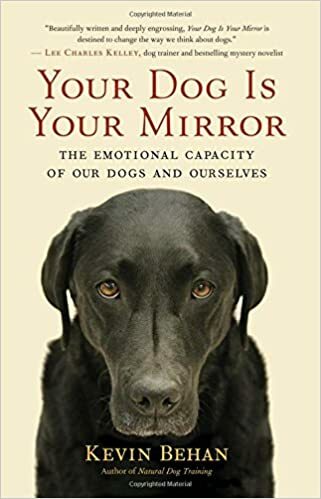 There is an awareness of the other dog’s body because of the licking of lips that both dog’s manifest, but it’s overshadowed by the momentum and upward thrust problems. Fortunately, the resistance of the Mirror Effect is regressing them in their body as an emotional battery to their earliest litter memories, and this again is what prevents them from degrading into an all out fight. One could say that their basic problem is that they aren’t able to feel yet how to align and synchronize along a common line of travel, that would solve the fundamental issue inherent in any interaction, a transfer of emotional momentum.